It’s October first!! Sigh…I love October so very much. My son and I went on a walk last night and the air was crisp, the leaves were falling and we could hear the sound of the high-school band in the distance playing during a football game. 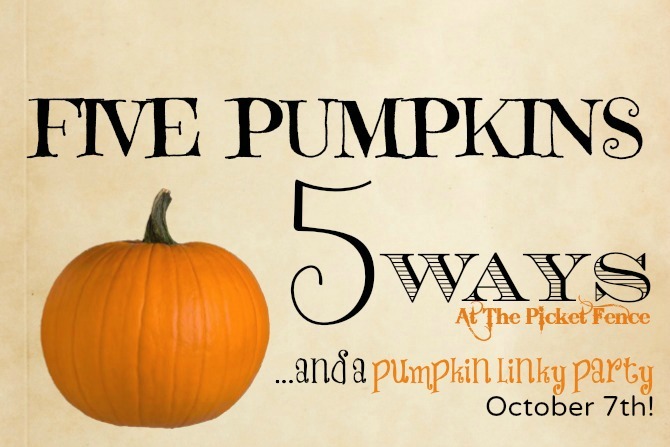 We are so excited about it being the first week of October that we are going to celebrate the first 5 days of the month by showing you 5 Pumpkins 5 Ways followed by a Pumpkin Themed Linky Party right here on October 7th! 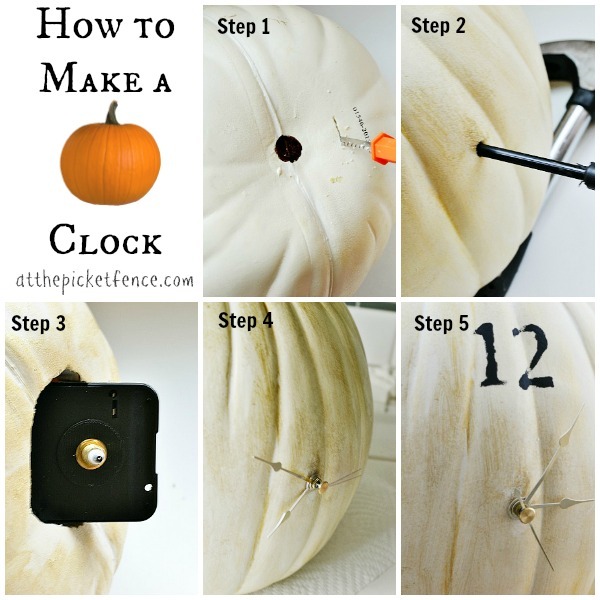 To kick things off I’m going to show you how to make a Pumpkin Clock. I had a totally different pumpkin craft planned for today but that ended up being a complete and utter project FAIL! So, what do you do when you know Pumpkin week is coming up and the clock is ticking? 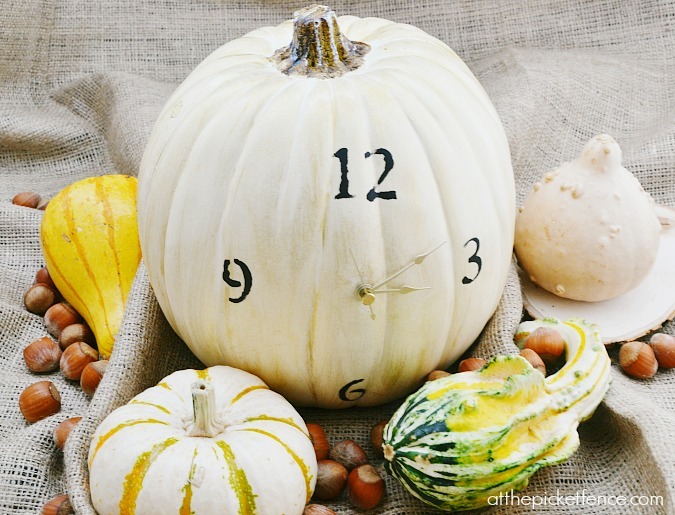 Why, you make a Pumpkin Clock of course! Step 1: Using a serrated knife or pumpkin carving tool, cut a hole in the bottom of a foam pumpkin large enough to put your hand through. Step 2: Determine the “face” side of your pumpkin and the location of the clock hands. Make a small hole by tapping on a screwdriver with a hammer. Step 3: Insert the clock mechanism (make sure to put the battery in first!) and feel around until you locate the hole. Insert the tip of the mechanism through the hole. Step 4: Attach the clock hands according to package directions. Step 5: Stencil numbers with paint or attach number stickers. Now, all you have to do is set it to the right time and jump up and down with excitement when you hear the “ticking” and realize that it actually worked! I don’t know what it is about this project but I feel a special kinship with this pumpkin clock. Maybe it’s because it’s so simple. Maybe because I love fall and I love being punctual which makes it the perfect combination. Maybe it’s because after my complete pumpkin project fail it was nice to have an idea actually work. Maybe it’s because my kids thought it was super cool which is the ultimate seal of approval. Whatever the reason, I love my little pumpkin clock. Be sure to come back tomorrow when Heather will be sharing the next Pumpkin Project in our series! 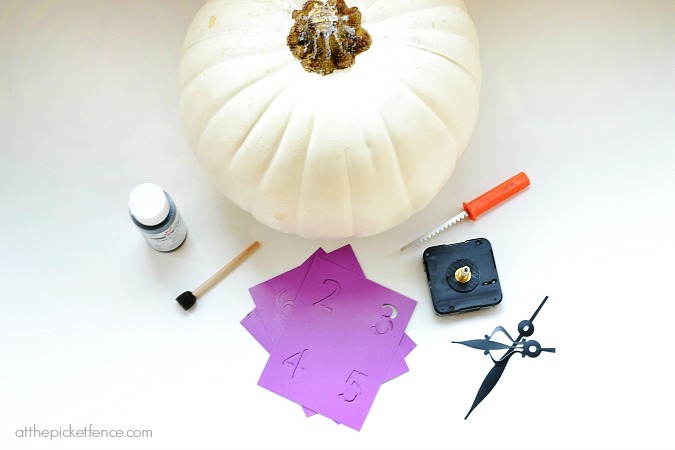 46 Comments on "5 Pumpkins 5 Ways ~ DIY Pumpkin Clock"
very cool – would have never thought of that!! So cute! Spotted this on Pinterest and headed right on over to check out this fabulous idea! So creative, girls! LOVE LOVE LOVE this fall project! I’m working on a pumpkin craft right now to link up on the 7th! You two are an inspiration gold mine! So cute! Great way to use a pumpkin, I love it! 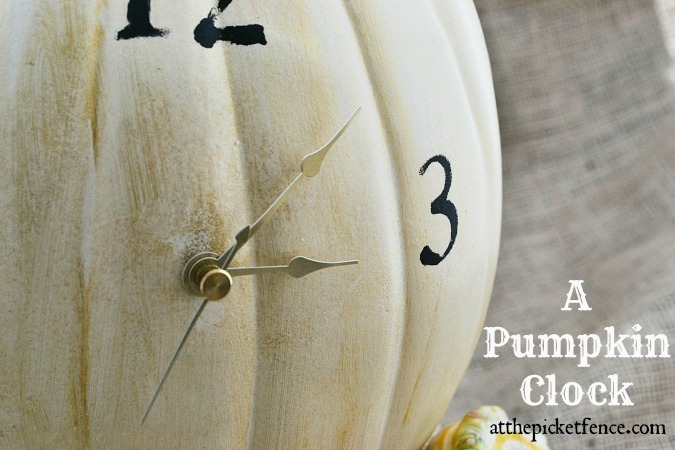 Love the pumpkin clock and I LOVE a pumpkin linky party!!!!! What a super cute idea Vanessa!! Waay too cute Vanessa…definitely the most unique pumpkin I have seen!! !…Love it! This is too stinkin’ cute! I love that it works too! Pinning & sharing! Vanessa! You hit a home-run with this one! I’ve been seeing all kinds of pumpkin projects in blogland but this one takes-the-cake! And…..your tutorial makes it look so…..easy. I just may have to make a pumpkin clock now. See what you started! A new trend….. This is SO fun!! I love it and pinning! Hi girlie 🙂 Love this – haven’t been in a blogland for awhile, missed you! OK I am in absolute love with this idea!!! So cute and fun! Pinned! So cute & creative! I love this idea. such a fun and super creative idea!! Wow, I absolutely LOVE this, Vanessa!!! Such an adorable and creative idea! Thank you so much for sharing! Pinning and sharing today…need to put this on my own must-make list! 🙂 Have a fabulous Tuesday! 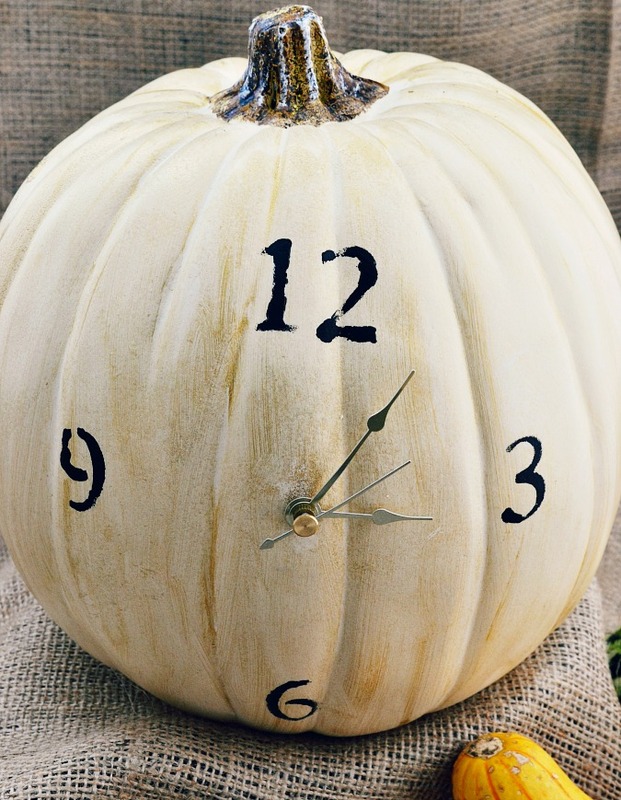 Your pumpkin clock is so sweet, what a wonderful idea!! Do you remember what thickeness clock hands you used? I see 3/4 and 1/4 inch options! Hi Ashley! My apologies for not including the width of the clock hands and also not seeing the question from Christie. Thank you for replying to her! 🙂 I used a gold colored craft paint to ‘age’ the pumpkin and simply did a wash type treatment by rubbing it on and then wiping it back off again so it would settle a bit in the creases. Hope that helps and I’m loving your version of the project! I am so bummed right now. I got the wrong size clock mechanism. Had the worst time trying to make it work. Decided to check the comments to see if I missed something. I didn’t even realize there were different size mechanisms. Blinded by my excitement. Oh well now I know and can fix it. Still very excited.